Honey Butter Chips or Almonds are very popular in South Korea at least for the past few years. Honestly, honey - butter sounds very interesting to me. This week I watch a video on Youtube about how to make Honey Butter Fried Chicken, it was from one of my favorite Korean Youtuber, Maangchi. So, I decided to make my own. I marinated the chicken with garlic as I prefer more flavorful taste. Double fry is a method that actually works really well for fried chicken. 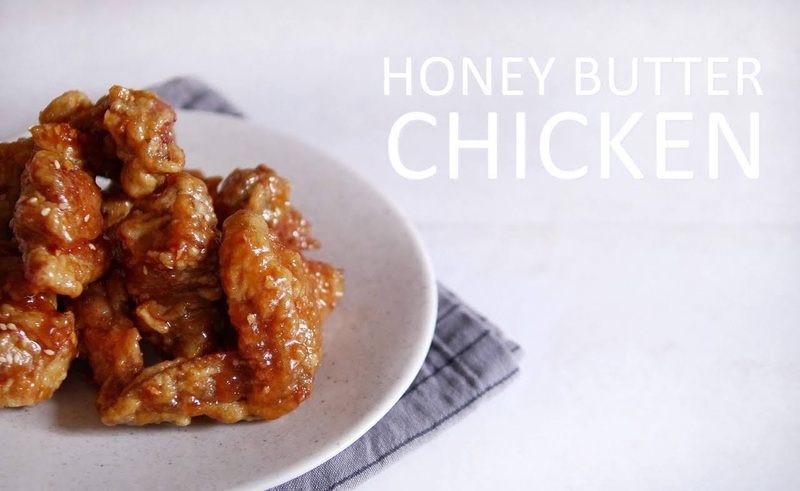 For the sauce, the original recipe calls for garlic, yes it tasted great but I found that you really can skip the garlic for even richer honey and butter taste. Sugar is great for coating while the honey is just as flavoring, one of the most important part (for me) is to add some of the butter in last minute once you turned off the heat. It will add stronger butter flavor.